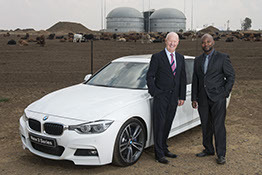 Bio2Watt built the first commercially viable biogas project in South Africa, the Bronkhorstspruit Biogas Plant, which it owns and operates. The plant produced its first power into the national grid on 10 October 2015. An independent commercial enterprise with an initial life cycle of 20 years, it will contribute to diversifying the South African energy mix away from coal. The project has resulted in the creation of long-term direct and indirect employment in peri-urban South Africa, which currently experiences high levels of unemployment. The success of BBP is likely to lead to many more plants. With over 14 million cattle in South Africa, a significant number of which are held on large farms, the potential for project replication is substantial. Interest shown in BBP indicates the development of a new emerging industry within Southern Africa. Bio2Watt has been asked to showcase the project at various national forums in order to pave the way for a smoother process for entrepreneurs wanting to start similar initiatives. The project is located in Bronkhorstspruit in the Tshwane Metropolitan area, a 40 min drive from Johannesburg or Pretoria and an agricultural stronghold in the Gauteng province. Situated on the premises of one of South Africa’s largest feedlots, Beefcor, the location provides proximity to key fuel supplies, grid access and sufficient water supplied by Beefcor’s storm water collection dams. The project’s most important accomplishment has been the outstanding goodwill and co-operation received from a diverse set of stakeholders, all of whom have assisted in bringing it to fruition. The early stage support received from funders was particularly helpful. Without the strong support of the Department of Energy, who will use this project as a benchmark for future deals of this nature, this project would simply not have been possible. Our primary success has been the complex facilitation of the project and the ultimate launch of the plant. Equally important, however, has been the interest generated within South Africa and the potential it has created to develop an entirely new emerging industry on the continent. Bio2Watt has been asked to attend and showcase the Bronkhorstspruit Biogas Project at various national and international forums in order to pave the way for a smoother process for entrepreneurs wanting to start similar projects. Bio2Watt is also a member of the South African Biogas Industry Association, SABIA and the South African Independent Power Producer Association (SAIPPA).